Jurassic World, the latest in the dino-adventure series, breaks free from it’s paddock tomorrow. In celebration of its release, I want to take a look back at what is, in my opinion, the worst thing ever in the first three films – the greatest sin, if you will. For a beloved franchise, the Jurassic Park series has really only had one truly great film, the original. Jurassic Park: The Lost World, was horribly unbalanced – half ham-fisted attempt to recreate Jurassic Park/half Kaiju film. The third, though thematically a return to form, was so unrelentingly diluted that all dread went out the window, replaced by horrible dialogue and even worse evolutionary choices for the dinosaurs. It is such a shame that the two follow-ups could not match even a quarter of the majesty that the first film created: the tingles you felt when you first saw a Brachiosaurus; the way you gripped the theatre armrests when the two raptors entered the kitchen door. Neither sequel was able to reach those emotional highs. So what was the worst possible sin in what is a plethora of bad decisions? Believe it or not, I don’t think that it was taking the T-Rexes to San Diego. No, for my money, the worst moment in the history of the franchise happens about half way through Jurassic Park 3. In an attempt to lure out some survivors hiding in a tree, two raptors leave a fellow survivor barely alive on the jungle floor. While they almost fall for the trap, the whole raptor plan is nullified when they hear the call of fellow raptors off in the distance, and choose to leave the area. So what do the raptors do with the man reeling in pain? Take a bite? Use their 6 inch retractable claws? Nope! The raptors apparently evolved the Schwarzenegger neck-snapping technique and forego all dinosaur instinct. WHY? Why on earth would a Raptor, a species that we have seen countless times go teeth on face of many different characters in the previous films, choose neck-snapping instead of evisceration. Once again, I think this came down to the third film’s more family audience approach. The entire film felt like a more child-friendly version of the original, and as such the brutality was diluted significantly, completely eroding the dread these dinosaurs had built over the course of the last two films. Jurassic Park, for lack of a better definition, is a monster series. These are horror movies disguised as adventure films. If we lose all fear of these creatures, their entire impact is lost. Even in the San Diego scene in The Lost World, carnage ran rampant. Check out the scene below and feel free to disagree in the comments. Interesting…what a weird bone to pick with these films (and there are plenty of bones to choose from). For one, I do love the slow-mo single claw backstab at the beginning of that scene. It’s one of my favorite dino moments in all the movies. But why is the neck snapping so weird? Despite its lack of blood, I find any neck/spine violence to be very unnerving. So they didn’t avoid the nastiness (at least for this viewer). Moreover, evisceration is great and all for raptors, especially if your prey is vertical, but here perhaps it’s just not needed. They know the guy is doomed but they don’t want him crawling away or the other humans to have a reason to save him, so they’re simply being efficient. 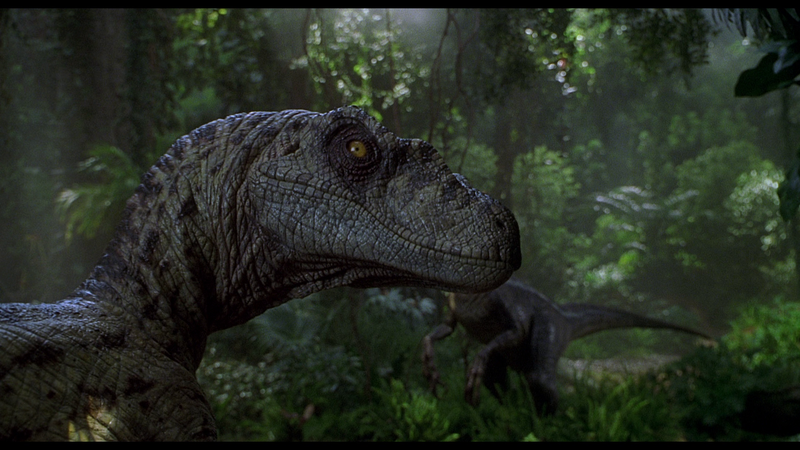 If there’s one thing that’s gospel in these movies it’s that raptors are smart. They could easily learn that this is a good way to permanently put down a vertebrate, while keeping things relatively tidy so the precious meat doesn’t leak everywhere while they’re off doing other things. I guess my issue is that Jurassic Park, though full of camp, has always been rooted in horror in my mind. I remember burying my head in my hands when I first went to see the original in the theatre. It was a sensation that was burned into my mind. To remove the visceral edge from the raptors, in essence, made them toothless. In horror all kills are not made equal, and nothing is as anti-climactic as a snap of the neck. To maintain any sense of true dread, Raptors must retain their predatory edge, and any and all fear I had regarding Raptors was eroded in that single scene. I will definitely check out your blogs.